French and Italian civil and military teams were working to contain a spreading oil spill in the Mediterranean Monday after a container ship collision off the island of Corsica that prompted France to launch an investigation into "maritime pollution". 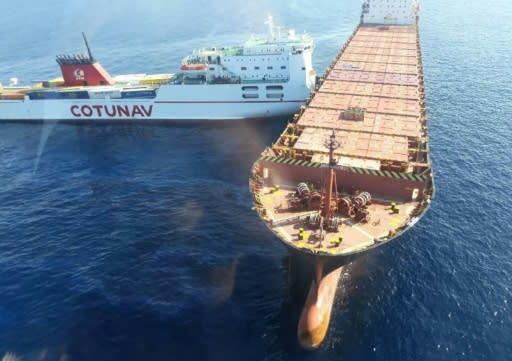 The accident occurred early Sunday when a Tunisian freighter rammed into a Cyprus-based vessel anchored about 30 kilometres (20 miles) off the northern tip of the French island. He condemned the "abnormal behaviour" of the Tunisian ship in a press briefing at Corsica's Bastia airport after surveying the affected area by helicopter. Italian anti-pollution vessels have begun pumping the slick, Rugy said, adding that while the collision occurred near the Cap Corse marine reserve, the spill remained outside the park and moving away from Corsica. The island is known for its pristine waters and beaches. "All means are mobilised, civil and military teams, French and Italian are working hard and doing everything so that this accident does not have ecological consequences," he said. "The first priority is to extricate the two boats," Rugy said, adding the operation was "very complicated", with the Tunisian boat wedged into the Cyprus-based CLS Virginia. An criminal investigation has been launched for "pollution" brought on by a "maritime accident", Marseille prosecutor Xavier Tarabeux said.